with insertion probe for wood chips and ram electrode or special probes, for measuring round timber, split logs, wood chips, sawdust, pellets, hay and straw bales. 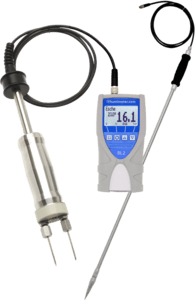 The humimeter BL2 moisture meter for wood and moisture meter for wood chips is a versatile moisture meter which can measure moisture of various kinds of woods in different shapes and wood chips. This is possible due to interchangeable extensions. Combined measuring instrument for insertion probe for wood chips, ram electrode for round timber and split logs or special probe. For measuring round timber, split logs, wood chips, sawdust, wooden pellets, shredded olive stones, hay and straw bales.